My Rating: ★ ★ ★ ☆ ☆ Honestly, it was boring. Average Rating on Goodreads: 4.12 ..... ._. 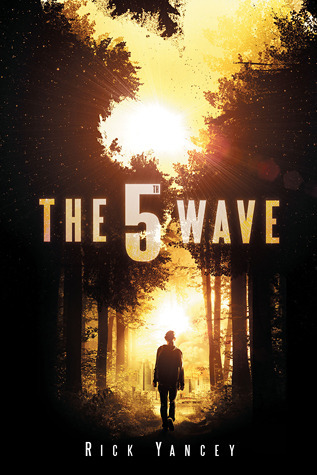 4th Wave. Alien apocalypse. One boy. One man. One alien. One very determined girl. One story. DUN DUN DUUUN!!! Eh. I don't get the hype. It was so boring it's not even funny. But at least Cassie was coooool!! :D They didn't misuse mah nammmee for some wimpy chick! She was all like HIYAAA DONT MESS WITH MEEEE OR YOU'RE GOIN DOWWWN. *ninja moves with MI6* I'M COMING FOR YOUU, SAMMYYY!! Oh one of the things that annoyed me most: THE POVs. *tears hair* It was tewwible. IT DIDN'T EVEN INDICATE IT CHANGED. *facepalm* I had to reread loads of paragraphs.. and it was TRIPLE PoVs. Cassie, Sammy, Alien dude, One human dude. Waaaaait... oh. 4 PoVs. IT WAS FOUR POINT OF VIEWS. DO YOU KNOW HOW CONFUSING THAT IS?? I was confused enough when it was only Caassiiiieee!! *pouts* The story was so nonsensical throughout the book. Definitely not one of my favs. I am honestly really disappointed... everyone luurrrves this one, and obviously as pointed out *points above* it has a hecka high average rating. Maybe it's because alien books don't appeal to me much? Apart from the Host..which was quite nice although Twilight wasn't my cup of tea at all. Oh Lux is also an awesome alien series!! :D But yeah. Aliens have to be well written or they come off as either really really cheesy, or just plain stupid. I think this was the latter...XD I mean, they didn't even have cool superpowers. They did absolutely NUFINK. Cept invade the world and all that jazz. So yeah.. I don't really know what to say. Mediocre. Nothing too special, but not like GAWSHH THIS BOOK IS JUST HORRID. Just meh.. I will not be reading the sequel. Sowwy.